In summer 2009 I posted about my first experiments with common plantain in Grandma Called it “Medicine Leaf” and Real Healing Potions. Plantain is a common lawn and garden weed. It has many medicinal properties, which are listed in the previous post, along with instructions for making an oil infusion. The leaves themselves can be applied directly to the skin, but for ease of use and long term storage, I infuse them in olive oil. 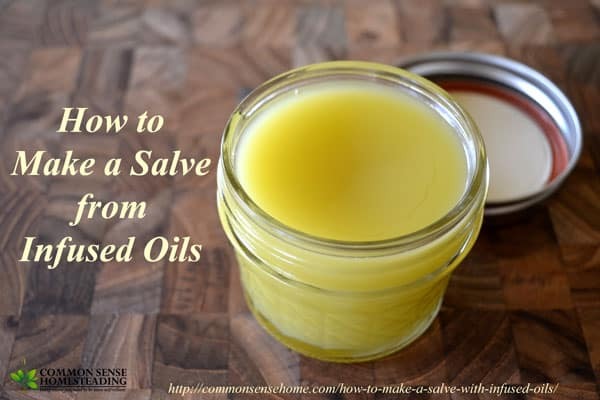 In this post I'll show you how to make a salve with infused oils. 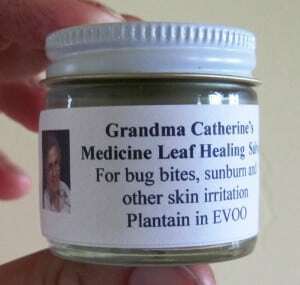 Plantain salve is good for insect bites and stings, removing slivers, hemorrhoids and other ailments. 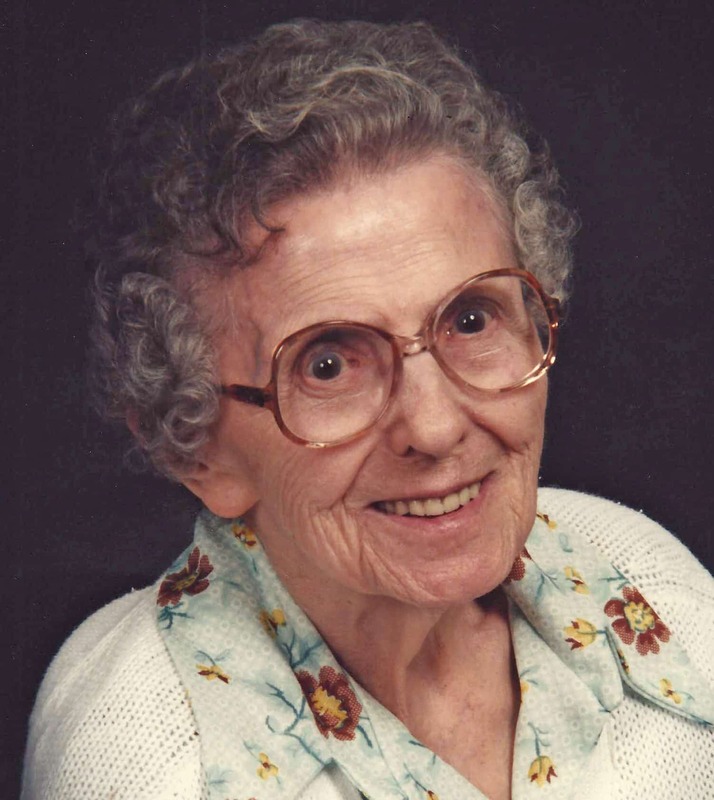 Oils are great for covering large areas (like when you get covered in mosquito bites or sunburned), but sometimes an ointment or salve is more convenient (for instance, to treat a single bite, or apply to hemorrhoids, or to pack in your purse – no spills!). 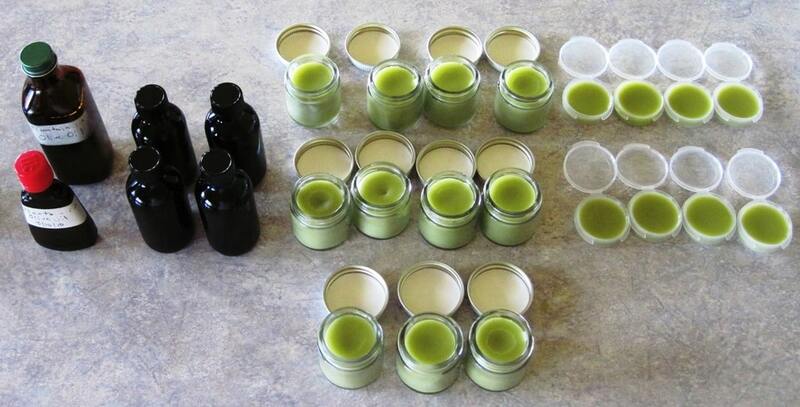 Once you have an herbal infused oil, making an ointment is quite simple. 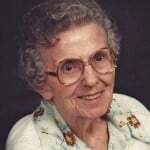 The following instructions are based on Herbal Healing Wise by Susun Weed. First, drain the plant material out of your oil. I use my Norpro Jelly Strainer. Place the pan on very low heat. Susun suggests a candle flame, but that didn't seem very practical. I set the burner on my gas stove to its lowest setting. Stir constantly until the beeswax is totally melted. This rarely takes more than a minute or two. I blinked and the pellets were gone. 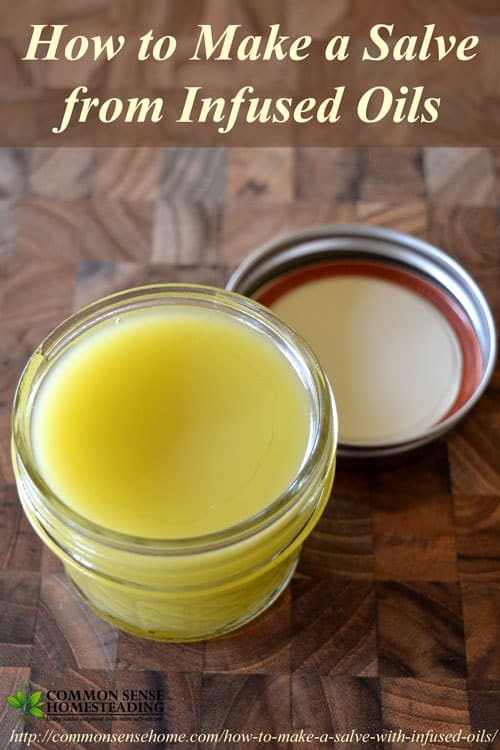 Pour the liquid into your ointment jar and allow it to cool and solidify. I ordered both one ounce and two once containers. The one once containers were plastic with flip tops, the 2 ounce were glass with metal caps. Below is all the finished salve and the extra bottles of oil I kept as oil. I reuse old extract jars, but I also purchased some glass jars. I sold some of these at the farmers market last year and also gave some as gifts. It was a terribly wet year and the mosquitoes were out in full force, so the salve was pretty popular. 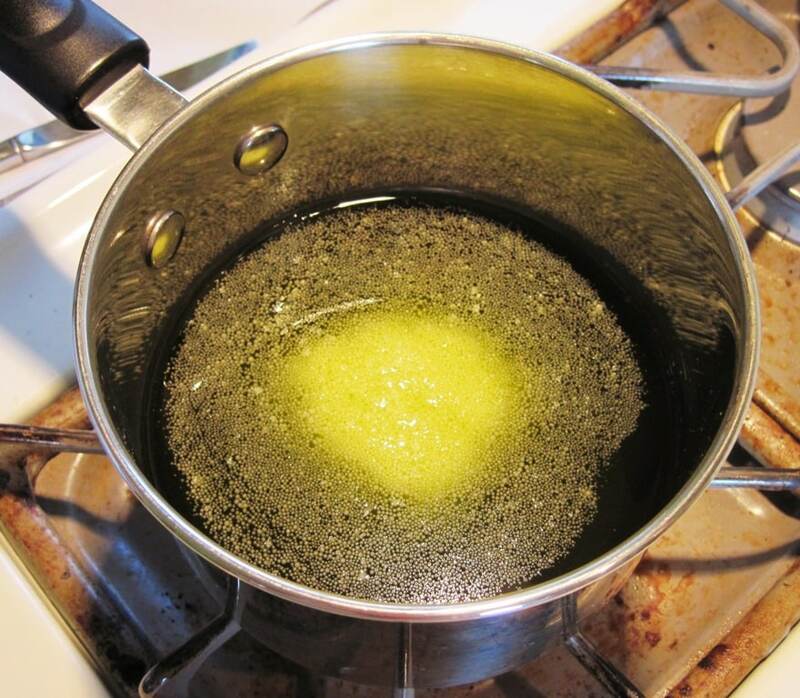 If you find the consistency of your salve to be too hard, remelt it and add more infused oil. If it is too soft, remelt and add more beeswax. Click here to order one ounce salve containers. Click here to order one ounce plastic salve containers. Click here to order two ounce glass salve containers. 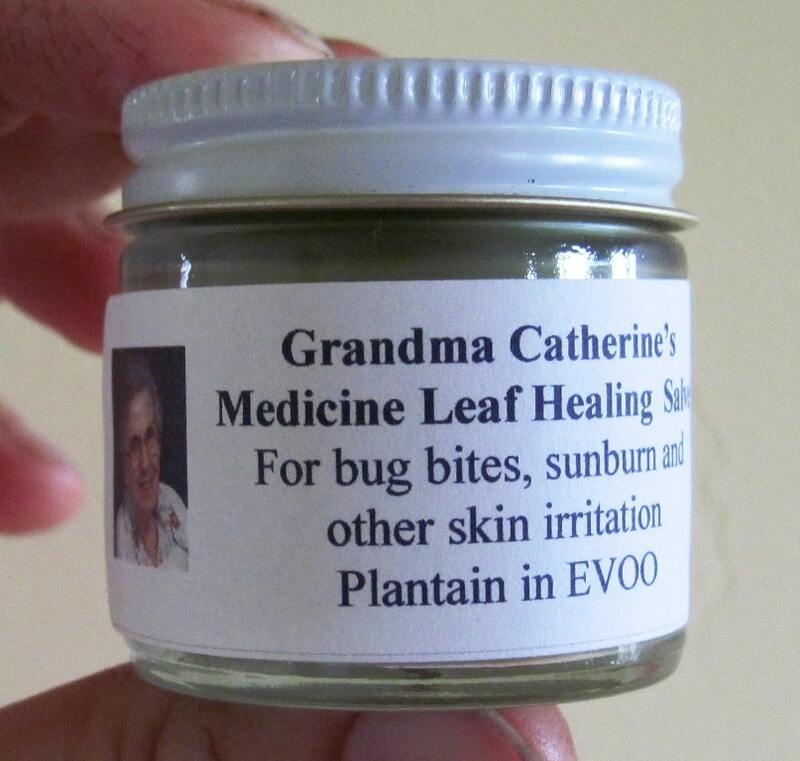 I made up labels with a picture of my grandmother on them, and named it Grandma Catherine's Medicine Leaf Healing Salve. I hope she'd approve. I have had funny results with beeswax pellets. I melted it with coconut oil and some other oil and then whipped it to make a balm. The wax was grainy because it cooled off again after it melted. Kind of weird. I have found that shea butter will granulate when cooled. It shouldn’t be the beeswax that is the problem. I also prefer not to use olive oil as it seems too sticky to me. I use Sweet Almond Oil, coconut oil, or grapeseed oil, and sometimes jojoba oil if I am feeling lavish. It helps to reduce the granulation to heat all your oils, beeswax and butters together in a double boiler on low for 35-45 minutes at 170-185 degrees. Remove from heat and then add Vitamin E Oil and Essential Oils if you desire. Whip when partly cooled, or just pour it into your containers. 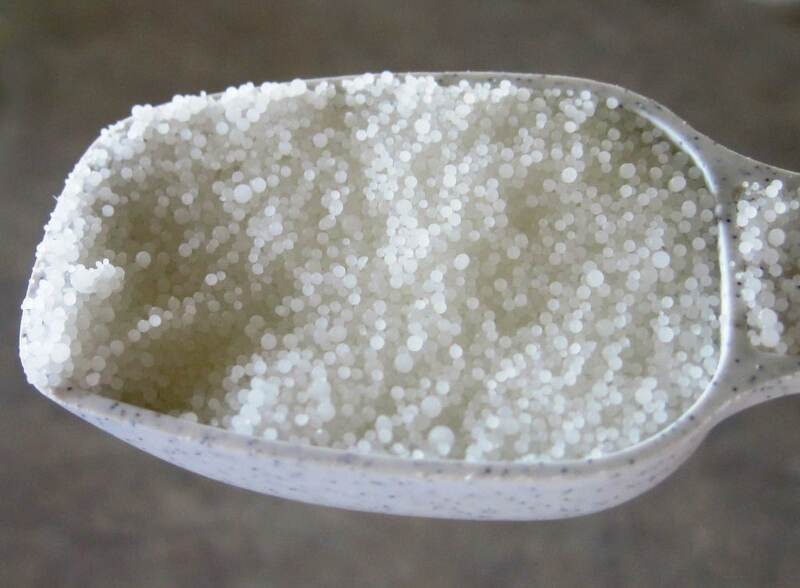 This should prevent most of the granulation. Can’t hardly call it Body Butter when it is more like ‘body rocks’! I don’t know how to yet. But I hope to learn. What about other types of plantain? I don’t have broad leaf growing in my yard but I think I have Buckhorn Plantain. It’s hard to tell since my husband insists on mowing everything and I never see the stalk or flowering part of the plant. If it is buckhorn, can it be used the same way? When I saw the title I thought it was plantain – part of the banana family, but I see in the link that is an entirely different plant. I live in tropical Australia so not sure that the plant that you are referring to is available here. My kids will chew a leaf and apply to a sting or burn. It really helps. I’d love to try making the salve. It sounds easy. Thanks. 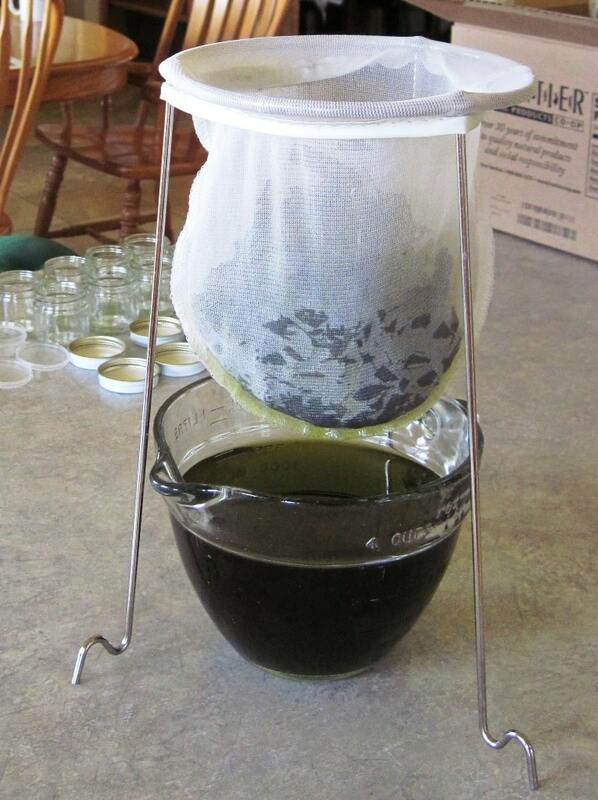 What kind of strainer are you using in the picture? Stephanie – It’s a Norpro Jelly Strainer. I added a direct link in the post. You can also find them in some hardware stores or where canning supplies are sold. I know you said to drain your plant material out of your oil my question is how long do you let it set for before you drain it and I just want to say I enjoy your site I have just started trying to do this stuff and would really like to learn more could you tell me what is the best brand of essential oils is the best to buy? Thanks so much. 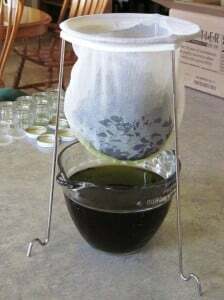 When I’m using Susun Weed’s method of sun infusion of fresh plant material, I usually infuse in a sunny window, stirring daily, for about four weeks. 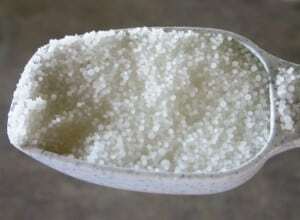 Other methods suggest a warm spot out of direct sunlight for 4-6 weeks. Still others suggest heating herbs and oil in a double boiler or heavy bottom pot, gently for 30 minutes to an hour. I use doTERRA and Aura Cacia essential oils, primarily doTERRA for medicinal use. I wouldn’t recommend using anything too cheap (like NOW brand) for anything other than say, cleaning your toilet bowl. For bee stings you are supposed to mix plantain and cayenne pepper. Michael Tierra says so. I’m not sure how much should be used in a salve. I never used it that way, when I go for a walk I carry a baggie of leaves and in another some cayenne. These fit in your pocket and don’t get in your way. If stung, take out the biggest leaf you have, crumple it up in a ball and chew with just your front teeth to break it open so the juice can come out. Then sprinkle a little cayenne on it. Apply to sting. It’s super strong used this way. I got this method from one of Michael Tierra’s books 20 years ago. If you haven’t heard of him, he’s one of the top herbalists in the country. I hadn’t heard of him before, but it looks like he has a lot of experience. How much oil and plantain leaves do you use? I use enough plantain to fill the jar and enough oil to cover it. My plantain has been sitting in the oil for about a year in july. Can I still use it or should I throw it out? Compost it and start over. I did get to try out the chewing it up and putting it on a bee sting the other day on my sister (she was skeptical) and it worked wonders…. I just started up a new batch this week. The mosquitoes are terrible this year. They are here in Indiana really bad too. I made some of the plantain salve & am wondering how long the salve should be kept for before getting rid of it & making new. I generally make a fresh batch each year, but so far it’s seemed to stay stable from one year to the next. I bought dried plantain because I couldn’t find any fresh. How much should I use in 1 cup of coconut oil? I usually just eyeball it, but a little less than 1 ounce of dried herb per cup of oil is a good general ratio. I just made this salve. I infused my plantain leaves in sweet almond oil. When I opened the infusion jar, it smelled “funny”. I used it anyway, with the bees wax and it is setting up now. The smell is not terrible, but different. Does anyone else have this issue? Do you think it is ok to use? Plantain in olive oil smells somewhat like pepperoni, so I would suspect that it smells similarly odd in sweet almond oil. I’m glad that you like it, too. Dried or fresh herb for oils? I’m assuming dried so it won’t go rancid? Either will work, but with fresh herbs, there is a greater risk of spoilage. I love your website….so much good information. I have used plantain for stings and bites and it is a magical plant. 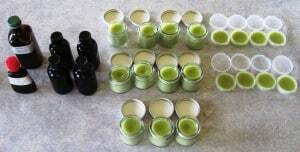 I never thought about freezing/drying or making a salve. I am planning on doing that this summer. I am so excited to get started….just a few weeks till Spring!!! Welcome, Pat. We love using plantain infused out and salves. It’s so easy to apply to bug bites and sunburn.